My first branded item: Too bad it was the early 90s. You could say I’m an easy target for branded items. Some branded items, like household goods, I choose simply because of personal preference. For example, in my humble opinion Viva paper towels are the best. Forget Brawny and whatever else there is, I will drive all over town and pass up the best deals on paper towels for one roll of Viva. Another example, my husband has a particular affinity for Heinz Ketchup. Every other brand, well, they just don’t compare. I once made the mistake of buying an off brand of ketchup because it was organic. In the words of Julia Roberts in Pretty Woman, “Big Mistake. Huge”. I have to say, though, I tasted the ketchup and it was not the same as Heinz, probably has something to do with the high fructose corn syrup or something. Other branded items, like clothes and accessories – they aren’t simply a personal preference. Though certain brands do fit me better and last longer, the majority of the items I’m attracted to aren’t just because they are well made. In the past, I needed a brand to make me feel good much like the way an alcoholic uses the bottle to deal with the day to day. It felt so empowering to own a genuine Bottega Veneta clutch. It was like I could hide my less than self behind this great brand. Short lived was the empowerment, but short-lived is often the life expectancy when you like something for unhealthy reasons. My first branded item was a pair of stone washed Z Cavaricci jeans that I bought in High School. Before, this most of my clothes were from generic stores, purchased in Peru, or were made for me by aunts. Oh how I coveted those jeans. 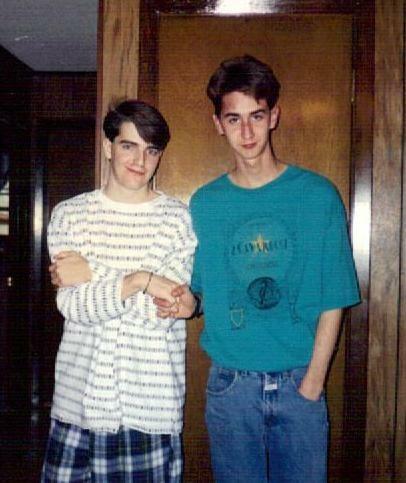 They were the ultimate early 90s, high school status symbol. I so badly wanted these jeans because I knew beyond a shadow of a doubt that these jeans were my ticket in – these wide hipped, tight waist, tapered legged jeans. I would win the world over – or at least I would win my small little world over. Instant fame and popularity overnight. What a disappointment. When I finally purchased a pair, nothing happened. I mean, I looked a little bit like everyone else, what with the permed hair and these new jeans, but clearly these branded jeans were no miracle worker. There was no instant overnight popularity. I did not feel nearly as cool or happy as those models in the ad looked. This strong desire to fit in, to be cool and popular didn’t stop in high school. But then again, when does it stop? Don’t we all want this even on just a little level? Doesn’t the Cheers theme song say, “Sometimes you want to go where everybody knows your name, and they’re always glad you came.” It’s human nature to want to belong, to be known, to be part of a group. I find myself wanting this on a daily basis and fighting my impulse to deal with it in unhealthy ways constantly.It cracks me up to think about it really. When I close my eyes and picture my dear friends, those people who are for me, that love me and accept me, I don’t really think about what brands they wear or how in style they are. I think about the great conversations we have, how we share life with both laughter and tears. Goodness knows, you have to have a little bit of laughter when you look back at some of the clothes you wore back then and the way you styled your hair. And well, sometimes those fashion disasters can bring on tears as well. You might think I’m bashing brands and fashion and style – I’m not. I truly believe that on some deep level in my heart, I have an eye and a love for fashion – aesthetically pleasing things. Things that with the right attitude, don’t hide the person that you are, but actually bring you into the light in full view. Just like these people you share life with – they aren’t there as a way to hide, but to bring about your greatest features.